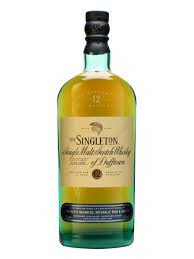 Singleton 12 YO Whisky is matured in a combination of American and European oak casks before bottling in the unique blue flint glass bottle shape inspired by a traditional hipflask from the turn of the previous century. Singleton of Dufftown 12 Year Old Speyside Single Malt Scotch Whisky has a deep gold colour, with toasted nut and rich fruit aromas. A drop of water releases classic Speyside fruit-sweet aromas. Light-medium bodied; sweetness, nuts, smooth fruity richness. Firm but balanced, hints of brown sugar and espresso coffee. Elegant drying finish. 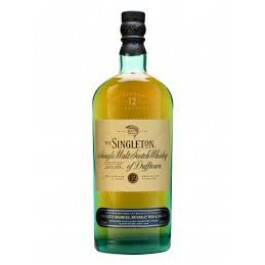 Singleton 12 YO Whisky is matured in a combination of American and European oak casks before bottling in the unique blue flint glass bottle shape inspired by a traditional hipflask from the turn of the previous century. Singleton of Dufftown 12 Year Old Speyside Single Malt Scotch Whisky has a deep gold colour, with toasted nut and rich fruit aromas. A drop of water releases classic Speyside fruit-sweet aromas. Light-medium bodied; sweetness, nuts, smooth fruity richness. Firm but balanced, hints of brown sugar and espresso coffee. Elegant drying finish.